Fourth Annual Dismas Family Farm Barn Dance! Join us for our fourth annual Dismas Family Farm Barn Dance! 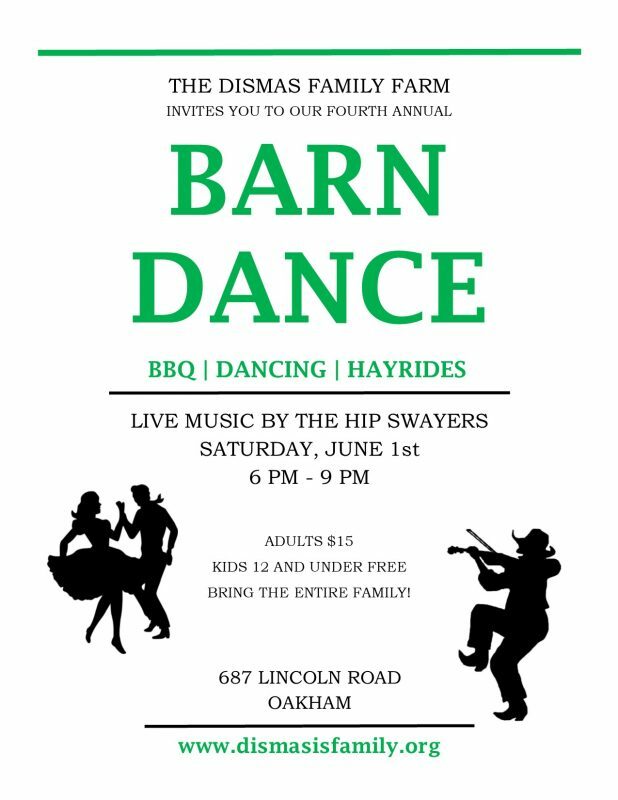 Dance under the stars and in the hay lofts with local musicians, The Hip Swayers, on June 1st, from 6 – 9 PM, at the Farm! Full BBQ dinner included with admission. $15 per adult–kids 12 and under free! A music-filled, fun-filled night for the entire family! Click HERE for more information. To purchase tickets securely through PayPal, please click on the link below. Your reservation will be held in your name at the door. Tickets also can be purchased at the barn door. See you on June 1st!